NINJA UNIFORMS sold at the lowest price, Guaranteed. Shinobi shozoku is the specific camouflage cover that is the part of Ninja uniform to wear by traditional warriors of the shade. 1. Uwagi aka dogi is a jacket. 2. Tekko or temaki are handmade puttees made from the whole trapezia-shaped cloth with loops for hooks. 3.Hakama from Iga or iga-bakama are pants popular among the most peasants from the suburbs of Iga and Koga. 4. Dodzime or shinobi-obi Ð Ninja belt of 2.5-3 meters long, a little bit wider than conventional ones. 5. Shinobi-tabi are Ninja socks. Unlike other socks the Shinobi-tabi had the sole made from leather not cotton to achieve higher quietness. 6. Fukumen is a mask. There are two kinds of masks, having two cloths of fabric (one cloth is smaller than another) or a single one long cloth of 25cm wide and 2m long. 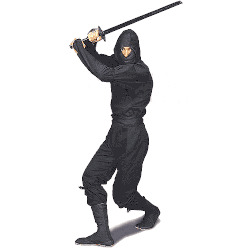 Warriors of shadow also used a hood cap called dzukin. 7. Nagabukuro is a personal bag to carry espionage belongings. The bag is tube-shaped and designed to carry as a rucksack. 8. Kusari-katabira is a suit of armour. As a rule, the warrior would use armor suits as the plain model. Kusari-katabira was made of a shirt, armlets, greave and heaume used as a mask or a hood to protect the head and neck and lower part of the face. Ninja used to wear Kusari-katabira under the camouflage suit not to make noise which is crucially essential for Ninja.